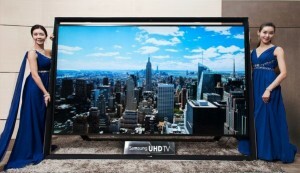 4K televisions are not cheap, even though the technology behind them is becoming more common. Samsung is bringing the expensive nature of 4K TVs to a whole new level with its new $152,000 TV. Samsung has introduced its latest over-priced 4K TV only a matter of days before CES 2014 and it has made the device available in China, South Korea, and the Middle East. Not only is this TV running at 4K, but it is also 110 inches, making it one of the largest on the market as of right now. By no means is this a consumer-level product and it would probably be cheaper to rent out a theater every time you want to watch a movie rather than to actually spend $152,000 on a TV, but for some reason, Samsung is coming out with these products just because it can. Although the Korean tech giant has launched the TV in foreign markets, it has said that the device will also be available to US consumers on special order sometime in early 2014. Of course, the amount of people that will actually purchase this TV can be counted on one or two hands but Samsung is still able to make headlines just by coming out with ridiculous products. 4K is becoming a major part of the media and TV industry but even as 2014 rolls in, there will be very little content available for people that are using 4K devices. Eventually the market will move in that direction but by the time that it does, Samsung’s $152,000 TV will be worth just a few thousand. NPD released a report last week stating that ultra-HD is finally coming into the minds of regular consumers rather than the exclusive group of wealthy enthusiasts that it had attracted a year ago. This is great news for companies like Samsung and its competitors, but it also means that it will be even harder to sell such an overpriced TV, especially when ultra-hd sets will be available for $1000-$2000 shortly. The average price of 4K TVs will fall below $1000 in China during 2014 and while it may take a little bit longer for prices to fall in the United States, they will get there eventually.